Matte Black Stainless Steel Custom Water Bottles - 24 oz. 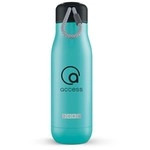 These durable stainless steel custom water bottles with bright color flip up drinking spout and straw and integrated carry handle is an excellent choice for your promotional drinkware gift option. Tritan Custom Water Bottles w/ Integrated Handle - 32 oz. Stay hydrated and keep your brand looking fresh and modern with these great Tritan custom water bottles imprinted with your company name or logo. Cool Gear Ledge Custom Water Bottle - 20 oz. Give yourself the edge with this ledge double-wall custom sport bottle which prevents sweating and keeps liquids colder longer. These colorful Cabana custom imprinted water bottles will be the hit of your summer promotions. Translucent Customized Water Bottle - 28 oz. This translucent customized water bottle is a great giveaway to any outdoors or sports person. Curvaceous Stainless Steel Imprinted Sports Bottle - 25 oz. Reusable and durable 18/8 single wall stainless steel and curvaceous look makes this a great promotional sports bottle.